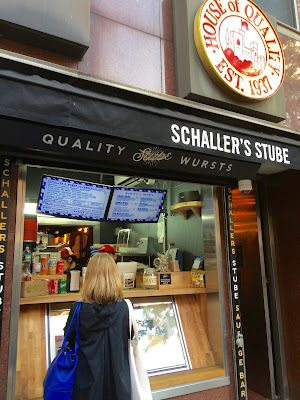 The story concerns a new “sausage bar” (yes, that’s a thing) on the Upper East Side called Schaller’s Stube, a brand new twist on the local hot dog stand. 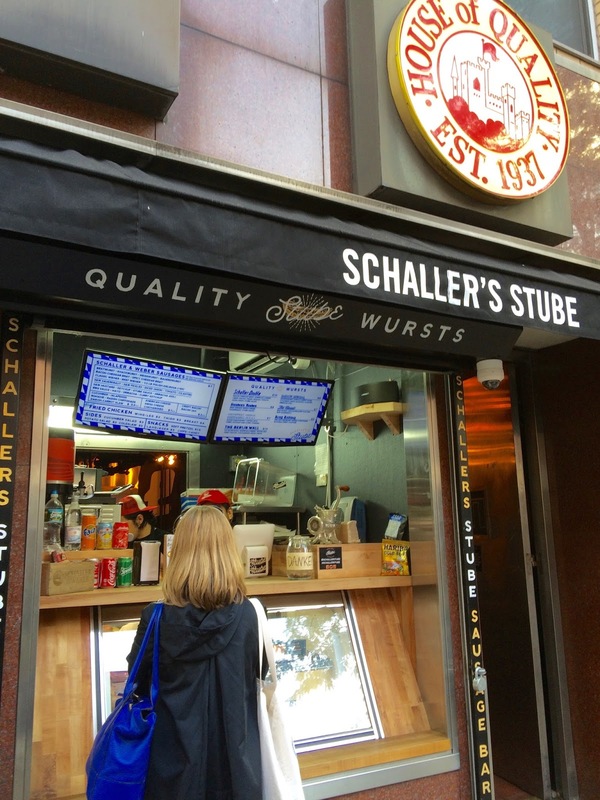 Schaller’s Stube features authentic Teutonic sausage and wurst, served practically on the street. Which means you can actually sit to dine. They have stools. Zany accurately notes that since the market news is dismal, the Wall Street Journal reporters have chosen to drown their sorrows in gourmet bratwurst. The sun is barely up, and I haven’t even had my Cheerios, and she’s already tempting me with savory, grilled meats. I think she’s my best friend ever. We agree that a “hot dog happy hour” is in order. It takes a little time to coordinate schedules, since evening adventures are new for us. In fact, anything that resembles brick and mortar is a pretty dramatic step. Low and behold, it is now the month of Oktoberfest and our schedules have finally synched up. Zany is thrilled. “The scent of sauerkraut is in the air,” she proclaims. We rendezvous after work at the 51 Street - Lexington Avenue Subway station and squeeze our way into a crowded number 6 Train that whisks us uptown to 86 Street. From there, it’s a short walk to Second Avenue, amidst the teeming humanity of the Upper East Side. 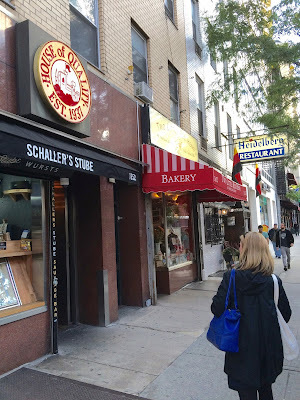 Schaller’s Stube is tucked between the Schaller & Weber charcuterie shop (that has been in residence in Yorkville since 1937) and one of those classic neighborhood bakeries where you put on the pounds just looking in the window. Schaller’s Stube is hidden behind the construction rigging that marks the future home of the Second Avenue subway, an urban improvement project that I am certain will never be completed in my lifetime. Schaller’s Stube has only been open a couple of months. What is a “stube” you ask? I had to look it up. One dictionary says a stube is an establishment serving alcohol and chiefly beer. Well, guess what? Schaller’s Stube is still working on getting its liquor license. That’s okay. 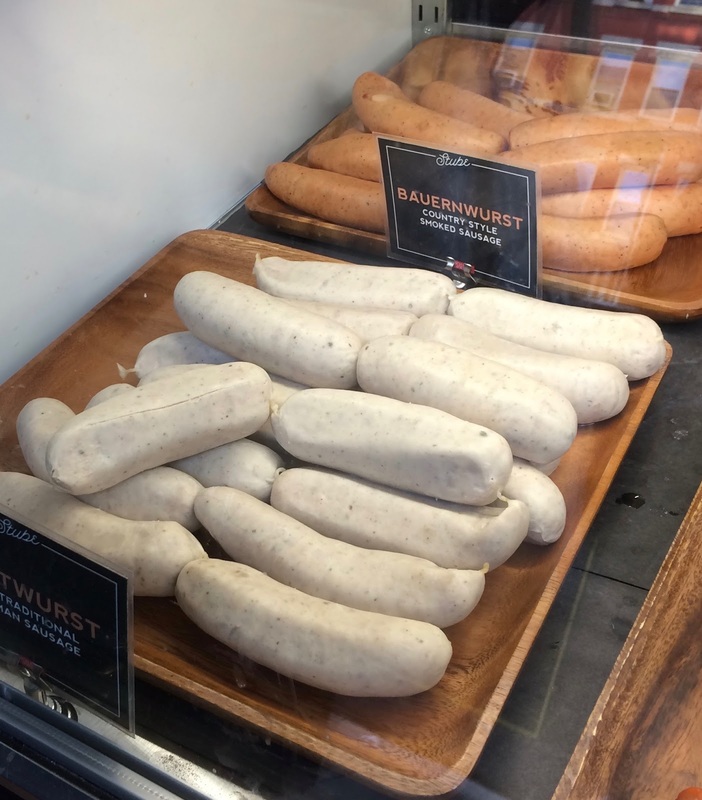 We’ve come for the wurst. 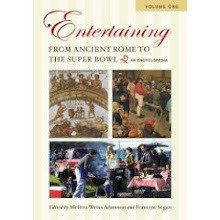 Other definitions hearken to German translations, which say that a “stube” is a lounge or parlor. This is more accurate. And quite frankly, for two folks who are used to dining on the street, the indoor accommodations are downright luxurious. Zany approaches the open window that faces Second Avenue. Two friendly guys wearing black t-shirts and red baseball caps lean forward, and exhibit an incredible degree of patience, as we take too long to debate our order. Should we get the formidable “Berlin Wall,” a half-pound of kielbasa covered with American cheese, bacon jam, crispy bacon, chicharones and diced onion, or what about Mrs. Schaller’s Fried Chicken, which sounds yummy but doesn’t quite seem suited to our Oktoberfest celebration? 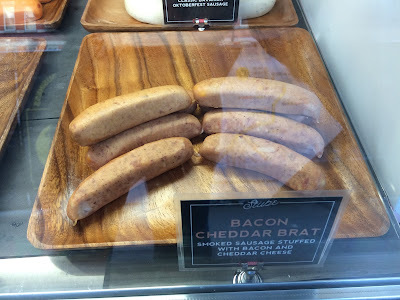 Or maybe we go smorgasbord and order a variety of tube steaks? Tempting us, right at street level, is a luscious selection of artisan wurst and brats piled high in a glass display case. After much debate, we settle on a savory tasting menu of Schaller’s best – “The Classic,” which is bratwurst, S&W Dusseldorf mustard and S&W sauerkraut, the “Steuben’s Reuben,” a beef wiener, Swiss cheese, sauerkraut and stube sauce, and the “Saigon Special,” which consists of bauernwurst, daikon-carrot slaw, cucumber, fresh jalapeno, cilantro and sriracha aioli. We place our order and move to the “parlor” which is an indoor space behind the street counter about the size of a small walk in closet – challenging if you’re claustrophobic, or great if you enjoy an intimate dining experience. At the back end of the parlor is a steel door and a sign that sharply warns us not to advance beyond a certain point. 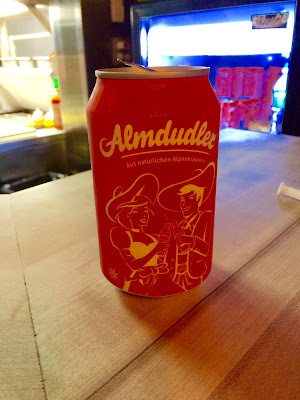 Our beverage is an Austrian fizzy drink called “Almdudler,” which our maître d’ explains is similar to ginger ale or elderflower cordial, and pairs beautifully with savory meats. 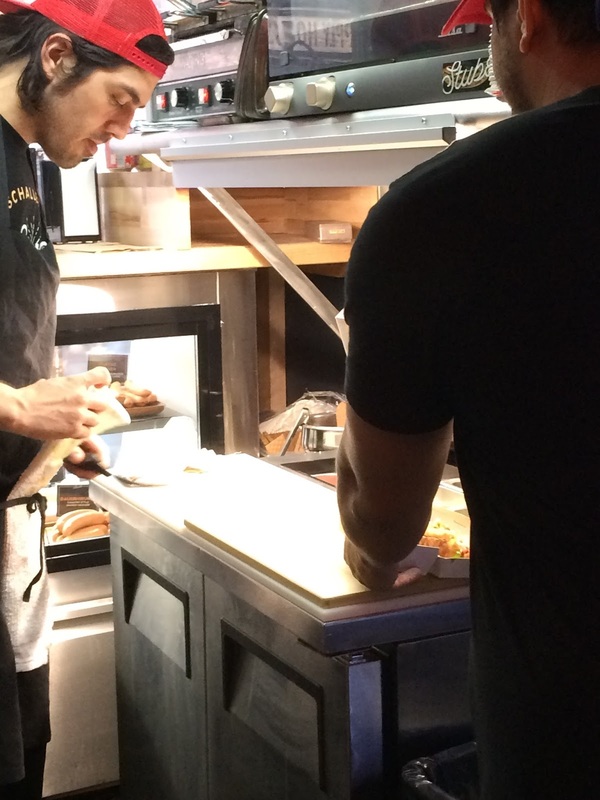 The executive chef and sous chef quickly whip up our order and each is a stunner. Zany puts her butchering skills into play and divides up the goods. 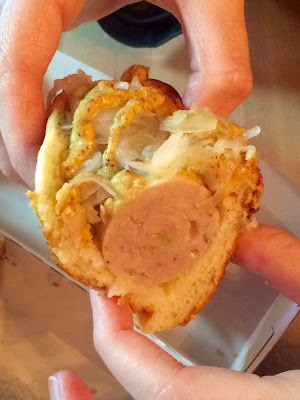 The first thing we note is that the rolls that surround the wurst are exquisite. 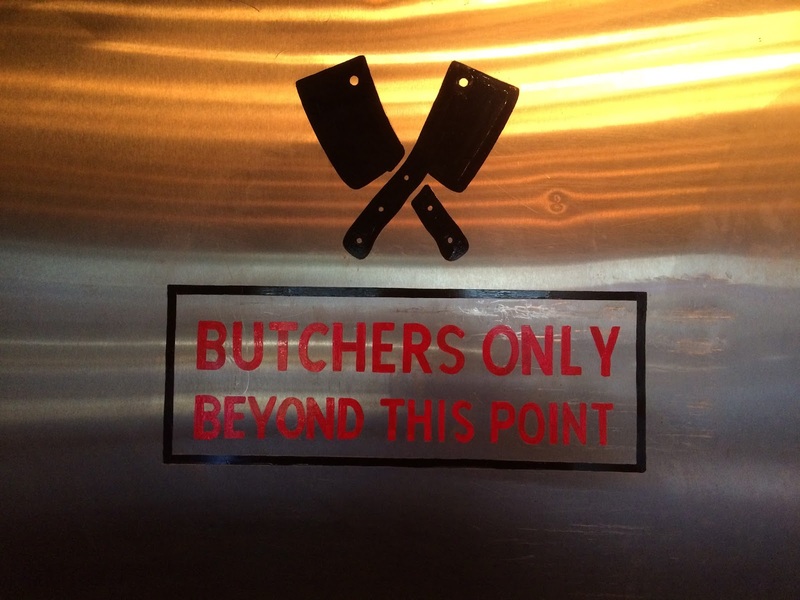 Toasted and buttery with perfect grill marks. “Is this brioche?” Zany asks? 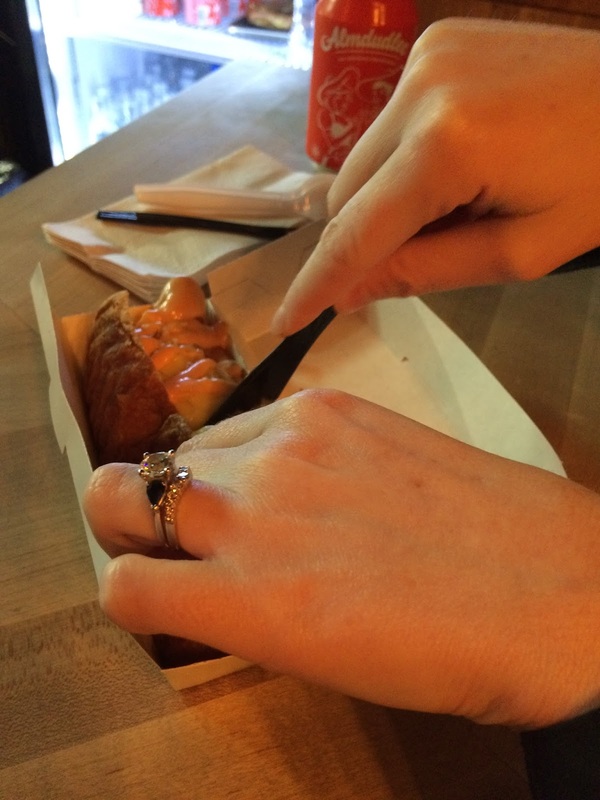 “You know brioche is not good for you at all.” I can barely hear her as I’m snarfing down the bun. 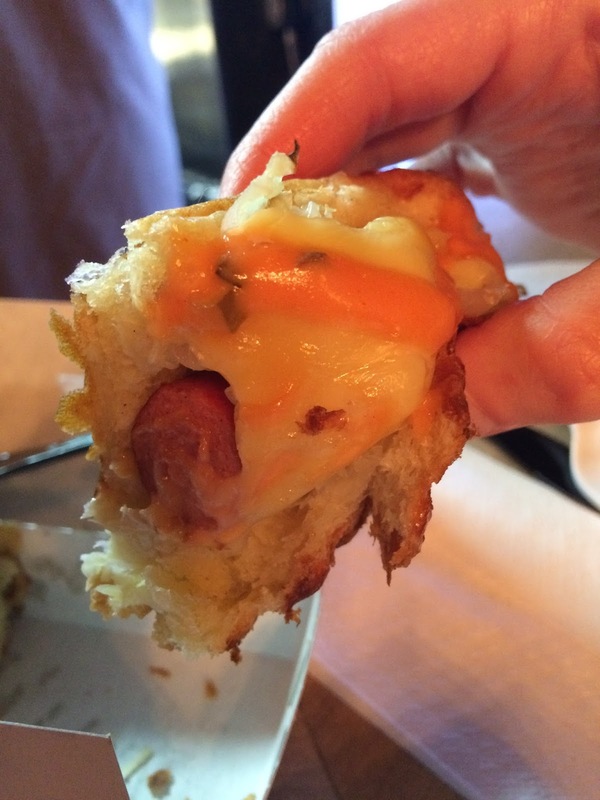 “This one looks like a German Cannoli,” she remarks. 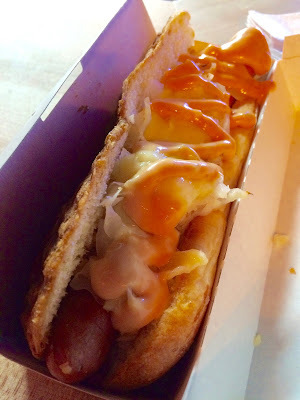 I like the fresh bite of the “Saigon Special” but neither of us can deny the sheer gustatory glee of “The Classic” and the “Steuben’s Reuben,” both smothered in sauerkraut. Zany reflects that she’s always been smitten by sauerkraut. 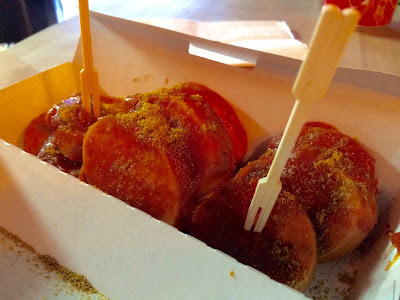 Having completely abolished our trio of wurst, I’m still in an adventurous mood, and I convince Zany to sample one more entrée, the Checkpoint Charlie Currywurst, also known as C.C.C. 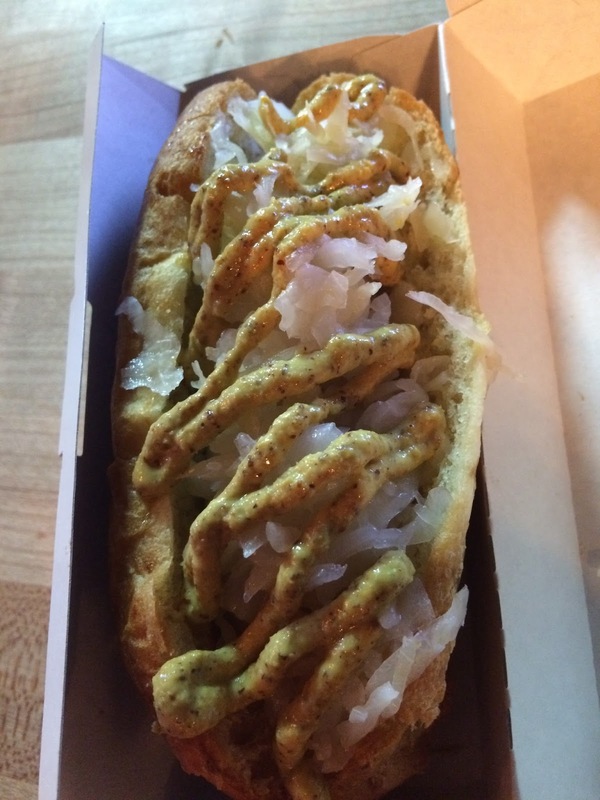 It’s a mélange of sliced knackwurst, topped with curry ketchup and curry powder. 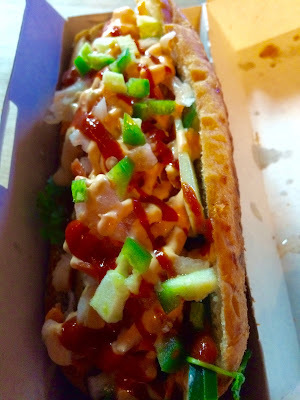 Our maître d’ explains that this is classic Berlin street food, and is traditionally served without a bun. That's good. We're watching our carbs. The dish is placed on the counter in a white cardboard tray, disks of wurst piled high. Zany inhales the spicy aroma. “Is this Germany, or little India?” she asks. 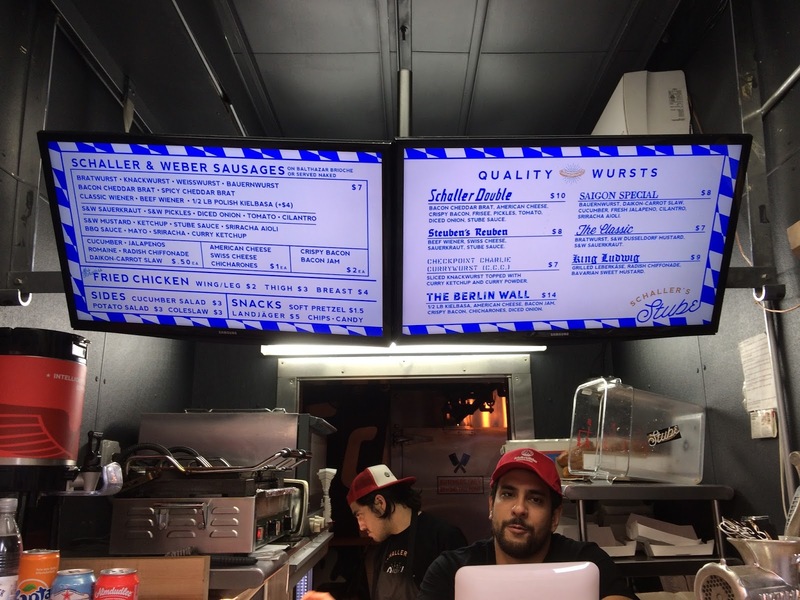 Within minutes, we bring that wall of wurst down. Zany glances uneasily at her watch, and I recognize the look of a conflicted commuter who is always on the mass transit clock. I raise an eyebrow. A glass of wine? How civilized. Perhaps there are some fringe benefits to dining out at night.